Now, I've always been used to the two features I'm about to show, but apparently several people here at Camp KDE weren't, and they were impressed. So I think these two deserve some mention. Advantage nr. 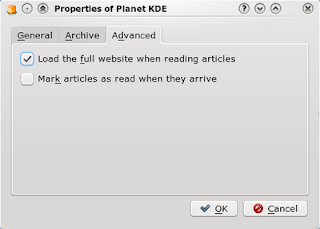 1: it is a KDE application. Thus why not show the full blog using KHTML? Advantage nr. 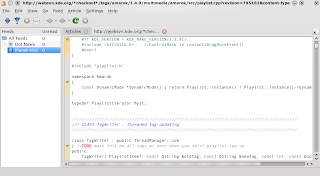 2: it is a KDE application. Thus why not embed kate_part when viewing a text file? including proper highlighting and everything. Works for pictures (embedded gwenview), pdf's (okular FTW), movies (Dragonplayer) etc etc etc. I had the same idea using this blog to point to bug 152072. I would use it, but if I read some of my RSS feeds at work, then some at home on my laptop, then some more at my desktop, it gets painful with these not all staying in sync, hence why I use Google's Reader. I do love the embedded nature of Akregator though, absolutely awesome feature. 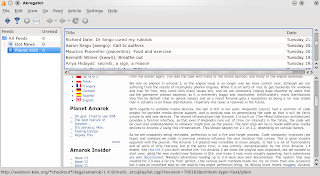 @Craig: Akregator can be syncronized with Google Reader. Just go to Settings >> Configure Akregator >> Online Readers. BTW it seems bug 152072 is being solved for KDE 4.2 right now. You can follow it in the link from the first comment.